A towering copper Serge Mansau sculpture housing a unique and striking composition by Richard Fraysse, L'Anarchiste is Caron’s 4th fragrance for men. It has notes of orange blossom, mandarin, cedar leaves, cedarwood, sandalwood, vetiver and musk. Orange clouds at sunset, red and yellow autumn leaves swirling and brushing against the tall trees where pomanders of clove and orange sway in the breeze. A nearby fire releases the aroma of precious woods as the sky turns from copper to indigo. Sprigs of mint are thrown onto the fire and we move closer to warm ourselves as the first flakes of snow begin to fall. This is the scent of early December. One of my favorite of all of Caron’s masterpieces, this offering from 2000 should be a must try for anyone in love with Caron’s ability to contrast and harmonize notes. Opening with a tangy citrus aroma, the fragrance quickly reveals a warm, almost nutty heart of woods while a faint breath of green cedar leaves and fresh orange blossom accents the midnotes. L’Anarchiste then progresses into a rich musk and creates an impressive sillage with good lasting power. L’Anarchiste has been a popular scent for discussion by fragrance connoisseurs due to the range of associations it inspires. Adjectives such as metallic, minty and spicy are often used, though none of these aromas are listed in the composition. While some find the woods to be the focus, others insist the orange notes take center stage. For me, L’Anarchiste has a story. I first tested it upon its release in 2000 during a warm summer in Manhattan. The scent was far too brooding and dark to enjoy. I quickly dismissed it and it wasn’t until a friend from Montreal sent me a decant in 2003 that I had cause to revisit it. The decant went into my backpack and there it sat until a chilly late autumn day when I found myself being gently caressed by a mystery aroma, definitely not the scent I had chosen that day. After hours of wondering what it could be, I realized that the decant had leaked in my backpack and that it was L’Anarchiste I was enjoying. The discovery was paired with a cloudy afternoon at a Japanese mountainside spa where I relaxed in an outdoor spring as flurries began to fall. I salvaged what I could of the decant and applied the scent after my bath and it’s been true love ever since. A collector’s piece merely for the impressive stamped black paper box and copper bottle that actually develops a patina as a result of the oils released from being handled, L’Anarchiste is a standout rarity in the world of men’s perfumery, and with a name like that, shouldn’t it be? 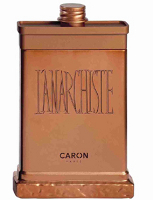 Caron L’Anarchiste is available at fragrancex, perfume.com, perfumebay, perfumemart, at escentual in the UK, or directly from a Caron boutique. L'Anarchiste is a very special men's scent. I have not sniffed another men's scent that can be compared with it. Totally unique. The bottle as Marls pointed out is amazing, even after the scent has been used up, it's worth keeping because it in actual fact, a work of art in itself. No two bottles develop the same patina. What a great review! I love the name. And now that you mentioned an “almost nutty heart of woods”, I really should finally try this. Nice review. This sounds wonderful. Another fragrance to seek out! Thanks, Marlen. It is one of my favourite Caron masculine fragrances, and as a woman I find it perfectly comfortable to wear. It smells of cider and spices. Very autumnal. KIM, COLOMBINA – definitely worth seeking out a sample of this! I'll be interested to hear your thoughts! It is a great scent, and one of my favorites from Caron. One of the true greats of the perfume world. Yes, there's something metallic coupled with orange, melded to something very odd. But the result is pure magic. This was my second “blind” purchase and my second Caron (the first of each was Yatagan) and I adore it. The added benefit is that hardly anyone else wears it. The downside of that is that it's sure to be discontinued one day. That's why I've invested in back-up bottles. Caron seems to be pretty good about not discontinuing things right & left, but even they aren't perfect. Would hate to see this one go. I recently opened my box of this wonderfully presented perfume to wear on a date to the theatre, and although I had visions of it being overpowering on me, (I'm a heavy-user/perfume addict), I was pleasantly surprised at how wonderfully balanced it was. L'Anarchiste is going to be a long-time favourite of mine for quite a while! I did the same as you did; and I adore them both. I also purchased Le 3'eme Homme as well. Love that too. Next is Royal Bain de Caron – wish it came in a spray bottle instead of splash; but I'll decant it into an empty Serge Lutens bottle. Caron is a must in every serious parfumista's wardrobe. After reading some overreacted comments on basenotes (guns metal images mixed with the fragrance Dracula would probably use) I've ordered a mini. Like people have noted here it's not that groundbreaking. On my skin it smells a lot like Eau Sauvage or something, and anyway, not a fragrance I haven't smelled before. It's sweet and warm and I can't didect any blood-like notes. It's very well made and has a nice depth on it but I can't say it wasn't a bit of a let down. I noticed the same thing. For me, it's about as threatening as a Christmas cookie, but some people seem to find it weird and strange. I wonder how much of this is due to the musks. Many people can't smell some musks, and I wonder if I'm missing something that other people are picking up, so that while I think I smell like a Christmas cookie, other people think I smell like a muskrat in heat? In my opinion, this is an excellent fragrance. Especially when you buy it at a discount. Starts off with apple pie. Cardamom, nutmeg, cinnamon. Plus the smell of the tang of the apple. At the end of the sniff, there is some kind of mint, not very sharp. Just mist. There are some traces of department store musks very deep in the composition, but they stay very subdued. I should say lavender, but I can't, I can only say 'lavender'. It does have the same thing that Azzaro calls lavender, but this is no way the bush that grows near my house. It stays incredibly linear. The tang, which I was afraid would go away quickly lasts extremely long. At least on fabric. The apple pie predominates upon short sniffs, and the mint with the deep ones. At the end of everything (24 hours later on the same sweater) It is apple pie with a similar trace of azzaroish lavender. Well done, unique with being made of only approachable notes. What's so Anarchistic about apple pie?